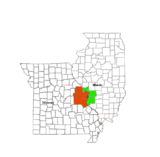 Jefferson County is a county located in the southern part of the U.S. state of Illinois. According to the 2010 census, it has a population of 38,827. The county seat is Mount Vernon. Jefferson County comprises the Mount Vernon, IL Micropolitan Statistical Area. It is located in the southern portion known locally as "Little Egypt". The western border of the county adjoins the Greater St. Louis consolidated metropolitan statistical area, the Metro-East region, and the St. Louis commuter region and market and viewing area. The first settler in Jefferson County is believed to have been Andrew Moore. In 1810, he settled near the southeast corner of the county, near where the Goshen Road emerges from the forest of Hamilton County into what is now known as Moore's Prairie. Moore arrived from the Goshen Settlement, near Edwardsville. His migration was therefore retrograde, from the west toward the interior of the State. In 1814, Andrew Moore departed with his eight-year-old son for Jordan's settlement, a journey from which he never returned. A skull that was believed to have been Moore's was found several years later about two miles from his cabin. Jordan's Settlement, also called Jordan's Fort, was southeast of modern Thompsonville, Illinois, about twenty miles south of Moore's cabin. This episode occurred during the War of 1812 when many of the Indian tribes were allied with the British. In 1816, Carter Wilkey, Daniel Crenshaw and Robert Cook settled in Moore's Prairie. Daniel Crenshaw moved into Moore's cabin. This settlement is believed to be the first permanent settlement in the County. Jefferson County was organized in 1819, out of parts of White, Edwards and Franklin Counties. It was named in honor of Thomas Jefferson, principal draftsman of the Northwest Ordinance, among other things. The baseline along the northern border of the County crosses the Third Principal Meridian at the northwest corner of the County. According to the U.S. Census Bureau, the county has a total area of 584 square miles (1,510 km2), of which 571 square miles (1,480 km2) is land and 13 square miles (34 km2) (2.2%) is water. In recent years, average temperatures in the county seat of Mount Vernon have ranged from a low of 19 °F (−7 °C) in January to a high of 88 °F (31 °C) in July, although a record low of −21 °F (−29 °C) was recorded in January 1994 and a record high of 114 °F (46 °C) was recorded in July 1936. Average monthly precipitation ranged from 2.45 inches (62 mm) in January to 4.58 inches (116 mm) in May. As of the 2010 United States Census, there were 38,827 people, 15,365 households, and 10,140 families residing in the county. The population density was 68.0 inhabitants per square mile (26.3/km2). There were 16,954 housing units at an average density of 29.7 per square mile (11.5/km2). The racial makeup of the county was 88.4% white, 8.4% black or African American, 0.6% Asian, 0.2% American Indian, 0.8% from other races, and 1.6% from two or more races. Those of Hispanic or Latino origin made up 2.1% of the population. In terms of ancestry, 24.3% were German, 15.8% were Irish, 13.6% were English, and 10.2% were American. Of the 15,365 households, 30.1% had children under the age of 18 living with them, 50.0% were married couples living together, 11.4% had a female householder with no husband present, 34.0% were non-families, and 29.1% of all households were made up of individuals. The average household size was 2.38 and the average family size was 2.92. The median age was 40.6 years. The median income for a household in the county was $41,161 and the median income for a family was $51,262. Males had a median income of $41,193 versus $29,645 for females. The per capita income for the county was $21,370. About 12.4% of families and 17.1% of the population were below the poverty line, including 24.8% of those under age 18 and 10.7% of those age 65 or over. In 2015 the county police department announced that the words "In God We Trust" will be on police squad cars. Travis Allen is the current Sheriff of Jefferson County. Jefferson is politically a fairly typical “anti-Yankee” Southern Illinois county. Opposition to the “Yankee” Republican Party and that party’s Civil War meant that Jefferson County voted solidly Democratic until Theodore Roosevelt carried the county in his 1904 landslide. It was to again vote Republican in the greater landslides of 1920 and 1928, but otherwise was firmly Democratic until World War II. Following the New Deal, Jasper became something of a bellwether county, voting for every winning Presidential candidate between 1928 and 2004 except in the Catholicism-influenced 1960 election, and that of 1988 which was heavily influenced by a major Midwestern drought. Disagreement with the Democratic Party’s liberal views on social issues since the 1990s has caused a powerful swing to the GOP in the past quarter-century: as is typical of the Upland South, Barack Obama in 2012 and Hillary Clinton did far worse than any previous Democrat. ^ a b "Monthly Averages for Mount Vernon, Illinois". The Weather Channel. Retrieved January 27, 2011.